Wins of 2018: R7 Watch the highlights from Richmond's Round 7 won over Fremantle. 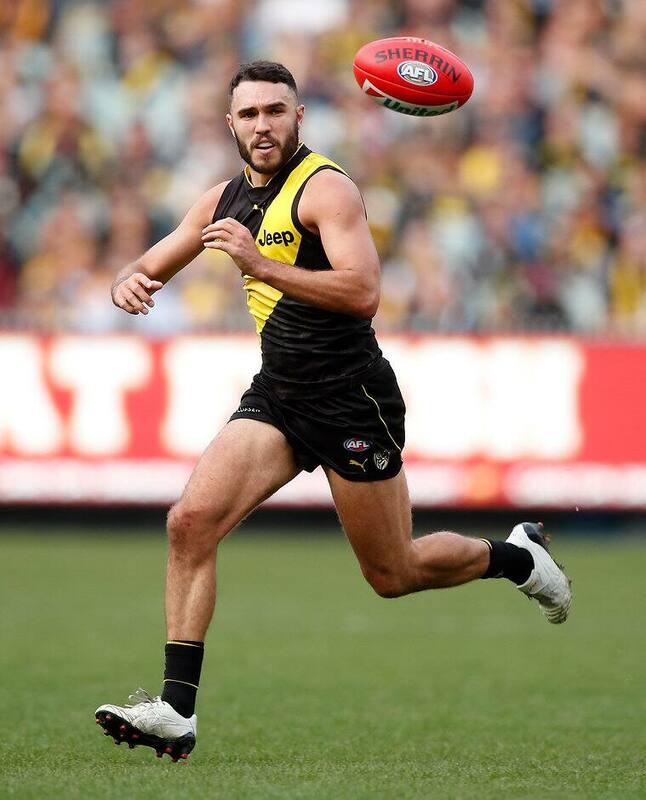 The underrated talents of clever Richmond playmaker Shane Edwards have been glowingly highlighted in the media this week. Edwards’ original AFL coach, Terry Wallace, and Champion Data senior analyst, Glenn Luff, were effusive in their praise of the veteran premiership Tiger. Wallace, now a respected member of the football media, is constantly bemused by how Edwards flies under the radar on match-days, given how influential he is for the Tigers. “It’s really interesting, when I do Richmond games, the amount of times that a commentator, whoever’s the commentator on the day, misses calling Shane’s name,” Wallace said on SEN.
“I’ll give you a piece of play . . . The ball’s buzzing around inside a pack and all of a sudden it pops out to Lambert . . . Lambert gets the ball, he handballs to Martin and Martin drives the ball inside forward-50. “How did the ball pop out to Lambert? The ball popped out because Shane Edwards got it and flicked it over his left ear from inside a pack of about 10 people – and no-one ever sees it! “I thought there were about six of his actions on (2017) Grand Final day that, if you blinked, you would have missed. “That’s why I think people at the game sometimes don’t appreciate his work as highly. While the football media focus is firmly on Richmond’s four big guns – Dustin Martin, Trent Cotchin, Alex Rance and Jack Riewoldt – Glenn Luff has provided an explanation of Champion Data’s long-standing high ranking of Edwards. “For years, people have said, why do you rate Shane Edwards so highly?” Luff said on SEN.
“The numbers made you look at the way he played. He wins it in really difficult situations, a high contested ball player. “What he does with it is just unbelievable. “He averages 19 disposals this year, but we have him rated in the top-15 in the competition. “The ability to get it to a teammate in a better position . . . he breaks the game up. “He has had 23 score assists this year, seven more than any other player in the competition.